Various types of Tubes are available for the ECLIPSE series microscopes. Although the LV-LH50PC Precentered Lamphouse is 12V-50W, the brightness is equivalent to or higher than that of 12V-100W. 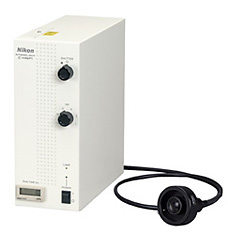 The low power-consumption halogen light source contributes to the compact design of the microscope while also being friendly to the environment. Defocus induced by heat is substantially reduced. The use of the Intensilight precentered fiber illuminator eliminates the need for centering and focus adjustment, even after the lamp is replaced. Because the light source can be placed away from the microscope, heat and electrical noise on the microscope body is reduced. Six levels of light intensity from 3% to 100% are available, and the shutter is incorporated. The lamp lasts an average of 2000 hours, reducing replacement time and costs. Both manual (C-HGFI) and motorized (C-HGFIE) models are available. The motorized model should be used in combination with the LV150A. 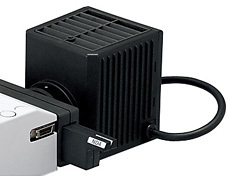 The motorized model can be controlled from an optional dedicated remote controller or a PC that incorporates Nikon's NIS-Elements imaging software. All the above illuminators are designed for the LV series. Various types of stages are available for the ECLIPSE series microscopes.